RCS 382 is a Leyland Titan PD3A/3 with Alexander L67RD body, new to Western in 1961. It was still owned by Western when the 2012 PSVC list was prepared, but with the ‘Stagecoach’ fleet number of 19982 instead of her original. In this view, on Middle Walk, Blackpool, on 29 September 1985, It was taking part in the Tramway Centenary celebrations. Only my opinion, but I think they looked better when the wheels were red. That said, was there ever a better turned out large fleet than that of Western? The independent Barton company became very satisfied customers of the AEC Reliance, taking its first one early in 1955. In subsequent years many more entered service, Alexander and Plaxton bodywork being favoured. Here is one of a batch of five 2MU3RV coaches with Alexander C41F bodywork delivered in May/June 1960. 839 EVO is seen in the summer of 1961 in London on Elizabeth Bridge, which straddles the main Southern railway line just south of Victoria Station. The present day transformation of the somewhat neglected building immediately behind the coach, notwithstanding the fact that it sits directly alongside a cutting carrying trains into the second busiest railway terminal in Britain (Waterloo is No.1) is evidence of the ‘gentrification’ of much of our capital city – (Oh for the old days). 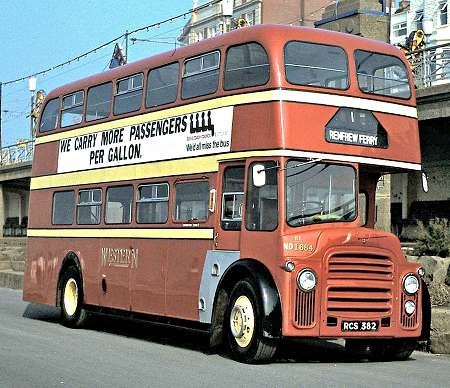 This type of Alexander body was widely used by Scottish companies, and were a common sight in the likes of Carlisle ‘Western’ and Newcastle ‘SMT’, but unlike the later ‘Y’ types, they weren’t embraced by many operators south of the border. That said, they weren’t a million miles away from the Park Royal bodies of the time. Was there a link? 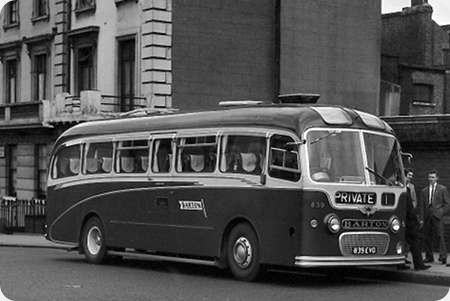 Barton also had a number of Leyland Tiger Cubs with this style of body. I think they were designated dual-purpose, but it was rather stretching the meaning of the term. The seating standard was at the extreme "bus" end of DP. They were used quite a lot on the 15 Ilkeston – Long Eaton – Sawley route. The Reliances were very much more coach style. I remember seeing them on the Nottingham – Warsaw service that ran for a few years in the 1960s. Strangely (most of?) the Reliance "coaches" had route number/destination indicators above the rear windows, whereas none of the Tiger Cub "DP/buses" had them. The PRV link with this body was indirect in that both this and the PRV ‘Royalist’ coach on Reliance were inspired by alloy-framed ECW and Scottish Aviation bodies of a couple years earlier. This style was first fitted to four pre-production Tiger Cub Coaches in late 1952. The first Royalist was on a Reliance for Birch Brothers in 1954. Also in 1954 SOL and ALexander took PRV bodied AEC Monocoaches and from 1955-57 had Monocoaches Reliances and Tiger Cubs with Alexander bodies to the same outline, after that they took a body with this frontal treatment but a straight waist. Meanwhile Barton and Western SMT took this style until 1960. PRV and Alexander both moved from Aluminium to Steel frames for their bodies at the turn of the decade to get BET orders, both built 30ft bodies to BET outline, and Alexander also combined this front with 31ft bodies for the Alexander companies and North Western in 1961 and 36ft Leopards in 1962 for North Western. I took a rear end photo of a 1961 Barton Plaxton Panorama coach at Chilwell in September that had a destination box like Stephen F mentions. Roger, do you know what would become of the five Alexander bodied Reliances? Were any of them ever sold to Ireland? I am sorry, Bill, but I have not been able to ascertain the later lives of these Alexander bodied Reliances, but OBP has some remarkably informed contributors, so hopefully some information will turn up. Stephen (Ford) – I’m intrigued to know more about the Nottingham to Warsaw service, which you say operated for a time in the 60’s! That, if true, might be more useful today! Think you will find Midlands-Warsaw services are running regularly just operated by Polish operators. Actually Roger my sense of humour was asserting itself there and I was being flippant. I think Stephen’s spellchecker had run ahead of him, as they do, way when possibly he meant the Nottingham to WORKSOP service, unless it was really true in the 1960’s, can’t see why though………! Hello David, I found this snippet from "Commercial Motor" dates 12 April 1963 : "Nottingham-Warsaw Bus Service Ends An express bus service from Nottingham to Warsaw has been discontinued because so few Poles can afford the £28 return fare to their homeland. The single-decker bus made the 2,000 mile round trip for the first time last August. The journey took two days—from Nottingham to Harwich, through Holland and Germany to Warsaw. But now Barton Transport Ltd., Chilwell, Notts, says the demand for the tickets is not sufficient to make the service Pay. Mr. Carl Barton, a director and traffic manager, said: "The Polish people showed great interest—Until it came to booking seats". Stephen, Re the Nottingham to Warsaw service of 1963. That’s brilliant of you to reply and come up with the goods. There’s nothing new under the sun is there? Who would have thought 50 years ago that services from many UK cities to Poland would be a commonplace thing in the Noughties! There was a fair concentration of Poles in and around Nottingham (including at least one who was a conductor and, I believe, later an inspector with Bartons.) Many were former airmen who came over during the war to continue the fight. I suspect that the difficulty was not so much the £28 return fare as all the other add-ons and hassle. A return transit visa for East Germany was around another £5, and I’m not sure how welcome "pre-war Poles" were by the authorities in post-war Communist Poland. And no, I’m pretty sure Barton didn’t have Worksop on their destination blinds. Nottingham – Worksop was a long-standing Trent (80)/East Midland (37) joint route, and any such ideas from Barton would have been taken to a Traffic Commissioners’ hearing and strangled at birth! 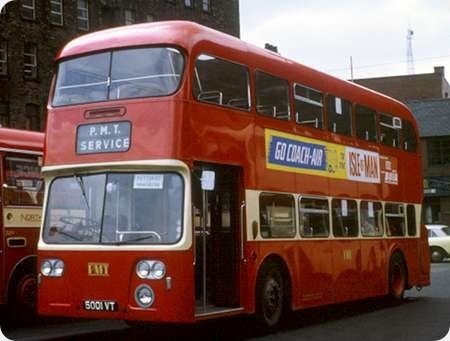 According to Alan Oxley’s history of Barton (part 3), the first (and only) round trip of service X60 (Nottingham – Warsaw) left Nottingham on Sunday 5 August 1962, at 1pm, taking as Stephen says, two days to reach Warsaw. It returned the following Saturday, arriving back in Nottingham on the Monday.I understand prolonged delays at Eastern Bloc countries were a significant factor in the service not running again, it was the time of the Cold War and the Cuban missile crisis after all. Two newly delivered Yeates bodied Reliances were used,49 seater 949 (949 MRR) from Nottingham to Harwich, and 945(945 MRR) from the Hook of Holland to Warsaw. 945 had been reduced to a 36 seater fitted with reclining seats, a toilet compartment and electric razor sockets (!). I can confirm 949 was used on the English leg, as I was at Huntingdon St to see it off – somewhere I have a photo of it prior to departure. Shortly after the round trip, 945 was reseated and the toilet removed. Every time I see a Sinbad coach in Nottingham, it reminds me of this Barton innovation. In reply to Bill Headley’s query above, according to the Circle fleet histories of Barton, none of this batch went to Ireland; however, there was a similar batch which entered service in 1959, 808-13(808-13CAL).Of these, 809 is given to Dodd, (dealer) Dromara 5/72, later to Lafferty, Glengad 4/73 and to unidentified farmer, Togher by 5/79. 811 is given to Dodds (dealer) Dromara 5/72, nothing further recorded. Thanks for this information Bob. I suspect the vehicle was destroyed in the summer of 1972 in the Derrybeg Estate, Newry – which is not very far away from Dromara. It was possibly owned by the local GAA and 811 CAL would seem to fit the frame as being the vehicle shown. The driver on Loline 861 (X42) was Harry Bell his wife was a conductor operating from Chilwell garage. As well as the airmen there were a large number of ex-miners from Poland from all 3 armed services who settled in the UK, many employed in the mines here. As an ex-paperboy I remember delivering several copies of the "Polish Daily ( including Soldiers Daily)" on my paper round and one of my friends was the son of a Polish soldier, who was married to a Russian lady who at one time was in Ravensbruck concentration camp. I thought it all very exotic ( especially his rather delightful elder sister whom I worshipped from afar…..). I think the main problem visiting was not financial. The ex-military types were very unwelcome, and I think the authorities were somewhat afraid of contamination, particularly in the aftermath of the Hungarian uprising. There might have been some reluctance too in view of a fear of retaliation for being resident on the wrong side of the iron curtain.